And if that's not the most unusual blog header I've ever written, I don't know what is! My tea towel has been patiently waiting for me to bump it to the top of the project to-do list. My husband's family is Irish, and I've always liked this blessing, and I had the vague notion of creating made fabric in various shades of green and thens sewing Drunkard's Path blocks that would frame the tea towel and represent the rolling hills of Ireland. I got this far and it just wasn't working for me. I think I may have been "greened out" after an emerald challenge quilt I did a couple months ago I was also struggling with adding brown and green so close to the brown and green border on the towel itself. So I decided to go bright instead. I pulled solids and wanna-be solids and (loosely) grouped them in warm and cool color combos. I tried to do some wavy piecing of some of the strips--something I always admire and can't quite seem to make happen myself. 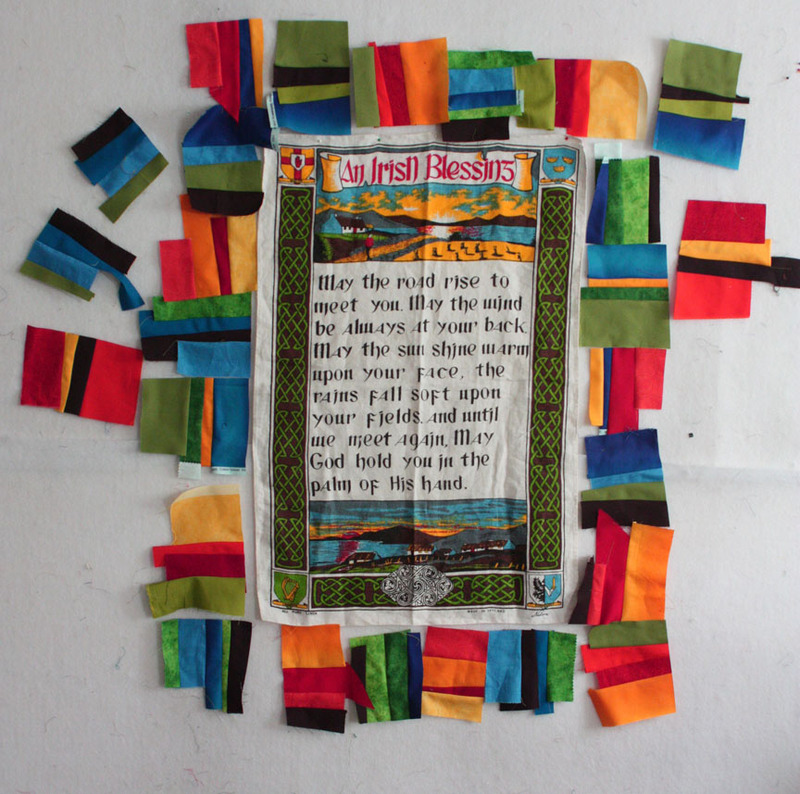 I had planned on an inner brown border, but again it was too close to the border on the tea towel, so I created a tiny pieced border first out of the scraps from the outer border. Seeing these tiny bright scraps chain pieced together just made me happy! 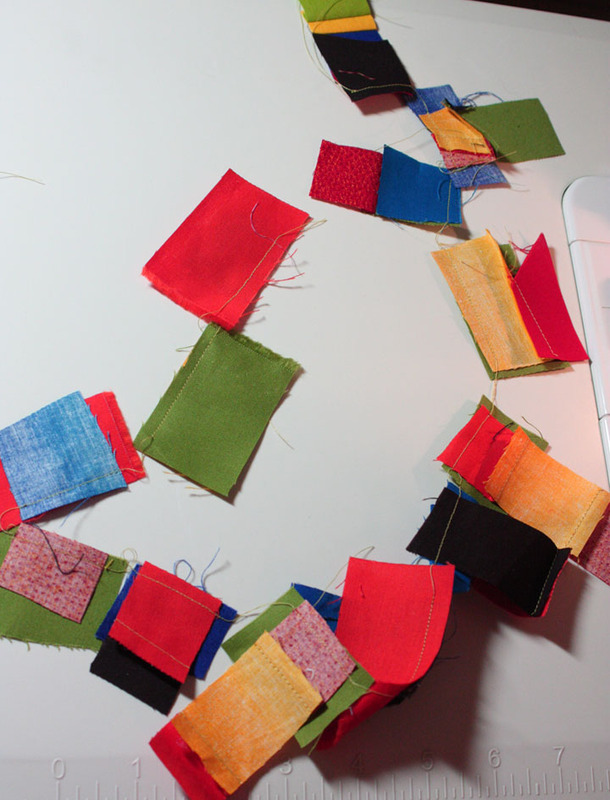 Now you understand the title of this blog post--it's very bright and technicolor-y! 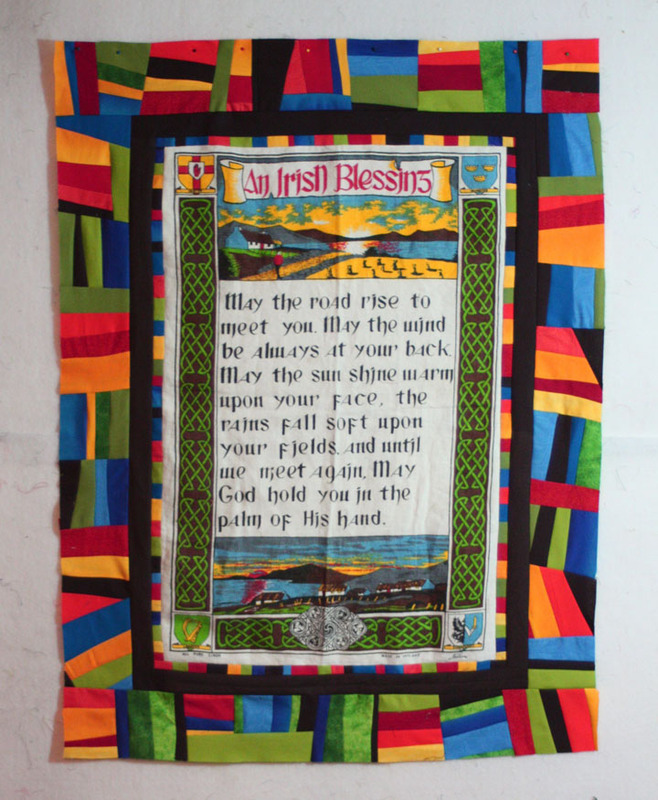 As far as something new--the wavy piecing was my none-too-successful attempt--need to try that again. 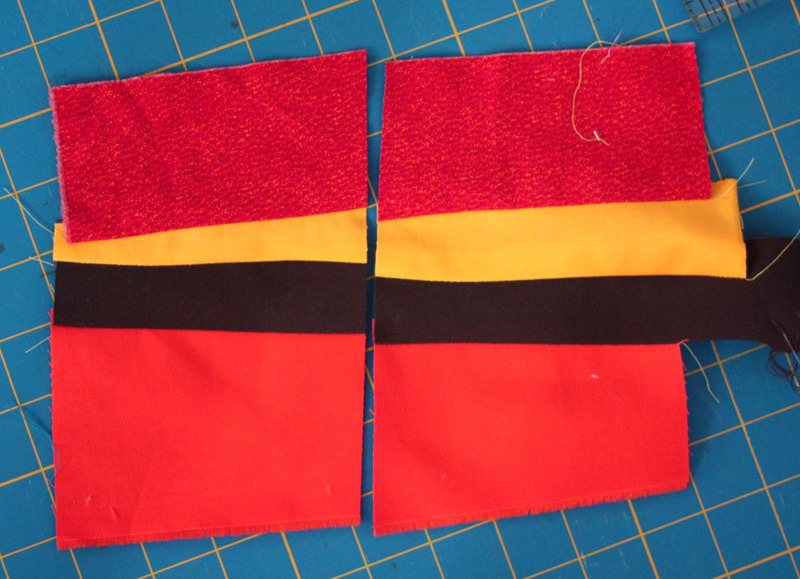 I haven't made fabric with just solids before, and I really like the graphic look that creates. 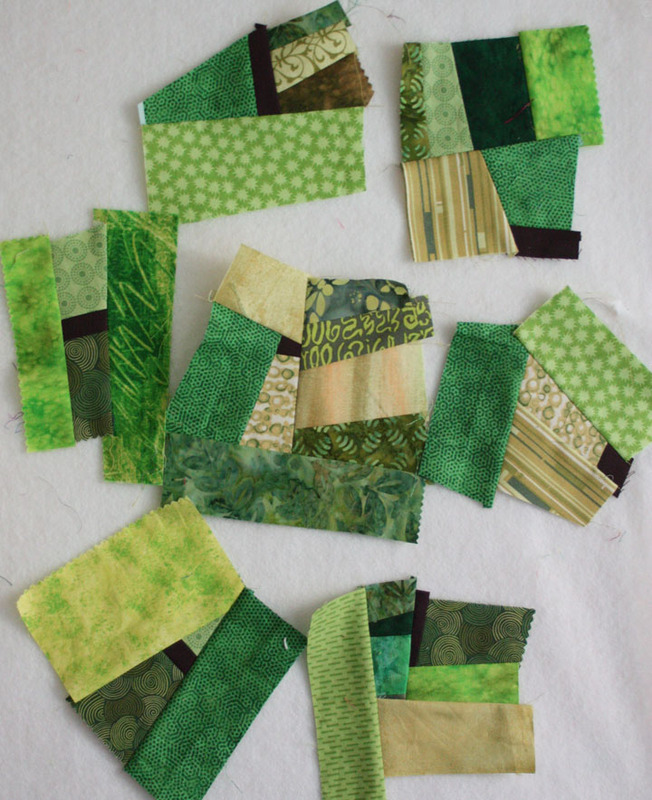 I also liked the freedom of sewing random chunks of made fabric together (in the past I've mostly made blocks and then joined those). 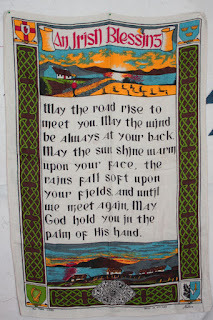 I am unsure about quilting this one--specifically the tea towel part, as it's a bit loose and stretchy, and I don't want to distract from the words. I'd welcome any suggestions! Looking forward to finishing this and hanging it in my house! That was a great decision to go bold and colorful! Yours is so lively now - it really draws out the other colors nicely. you could tie the quilt. little bitty bits of yarn, like upholstery carefully placed. Love how this turned out! Sort of Joseph-y, also looks a bit like Kente cloth too? No matter, it is vibrant and exciting and it makes you happy! 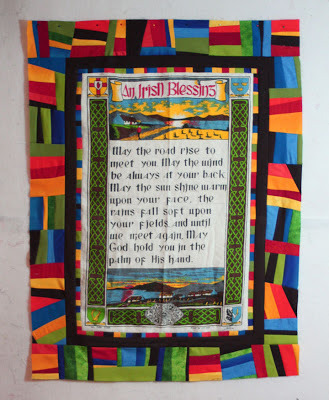 If your towel is stretchy, either baste heavily, or maybe use basting spray adnesive, and I would quilt between the lines of text, and keep the amount of quilting consistent throughout the piece. Keep the quilting lines simple, let the piece speak for itself. Enjoy! Your decision to scrap Plan A in favor of technicolor Plan B was brilliant! Love the small colored border next to the tea towel. 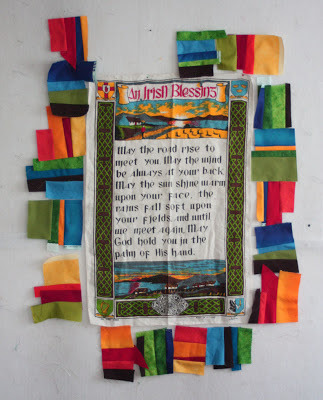 The outer made fabric border reminds me of a variety of roads or paths. I love the bold colors! Great job! Preservering is a wonderful quality you have! Love all the brights, it's a great contrast for the tea towel. Lots of "wow" factor for sure. You could quilt it with just straight lines across between the rows of writing. Fabulous! 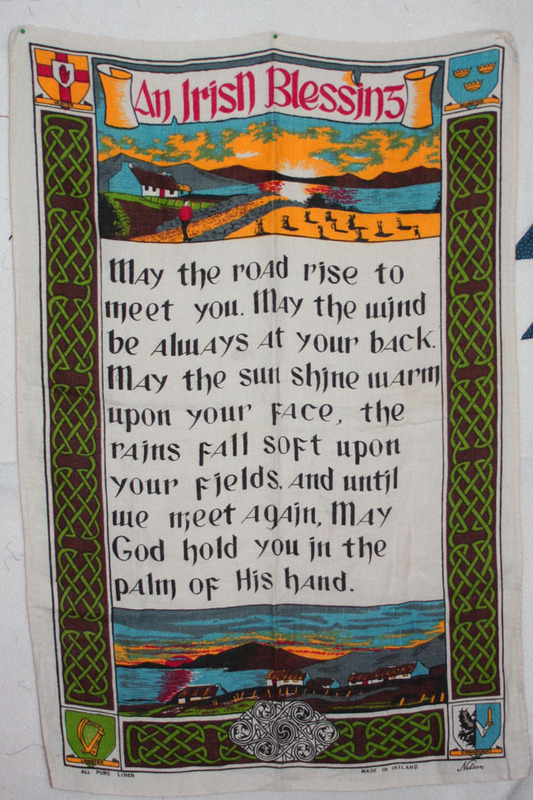 I love the words in the tea towel and the zingy colours. It's going to look great as a wall hanging. Love the solids! Well done!!! a perfect finish!!! It looks fabulous, the colors are delightful ! Do I ever love this! Great job girlfriend! Beautiful! 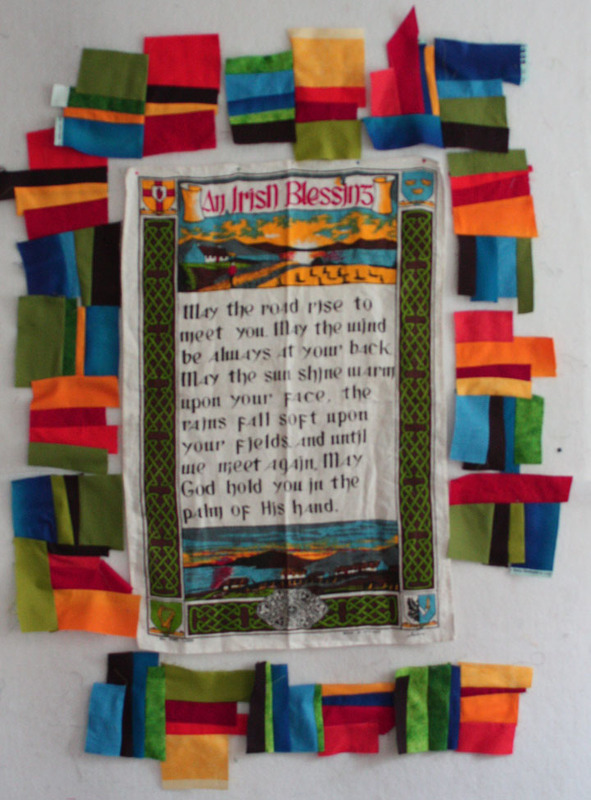 I am Irish and I was christened "Josephine" so I say fantastic job and wonderful title. Thank you for showing us how you came to use those colors, I love it!